The birds exited. And then came the rain. We got our gear into the car just as the first rain drops hit. Previous PostBarred Owl in Bamboo GroveNext PostDo Birds Play Chicken? What a stormy sky! I thought the distant Ravenel Bridge looked amazing so looked it up and got a lovely lot of photos at https://scpictureproject.org/charleston-county/ravenel-bridge.html Thanks for including the name in your caption Ellen. That bridge is a visual treat, Liz, and can be seen from a lot of the area’s attractions. Happy to send you on an exploration! It was great. Visual treat is just the description for it! That is one stnning image, Ellen! 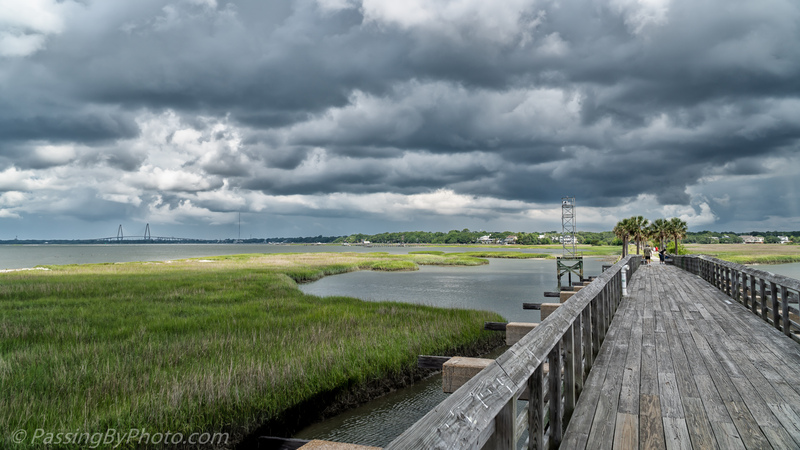 I love that wooden bridge leading the eye in towards that wall of stormy skies. Thanks, Pete! It was worth stopping as we headed for the car–we could feel the rain coming. What a spectacular photo Ellen! Thanks you, Belinda! It would have been neat to stay and watch more but that is a flood prone area and we felt we better get to higher ground. Turns out there was a record rain fall over the next two hours. I love those stormy clouds.